Great Wilkins Halls are situated in a great location for students that attend the Falmer campus of the University of Brighton. In order to accept your place in Great Wilkins Halls of Residence you need to sign or accept the accommodation contract online and pay your first rent instalment within seven days of receiving the offer. If you are unable to do this, please let us know so that your room is not allocated to another student. You do not have to pay a deposit; the first rent instalment will be the equivalent of 28 days of rent. This is not applicable for care leavers. The first rent instalment must be paid before you move into the accommodation and within seven days of receiving an offer for a room. The remaining rent for 39 week contracts is paid in three equal instalments in October, January and April. 50 week contracts have four instalments with the additional payment due in July. Further details of how to pay will be sent with your offer for a room. Great Wilkins is located perfectly for University of Brighton students that attend the Falmer or Moulsecoombe sites. The Falmer campus is less than a 5 minute walk away from Great Wilkins and Moulsecoombe is a 30 minute bus or 10 minute train journey away. There are great transport links to get you into the centre of Brighton which is only 40 minutes by bus. London is only 50 minutes away and Gatwick airport just 30 minutes away. 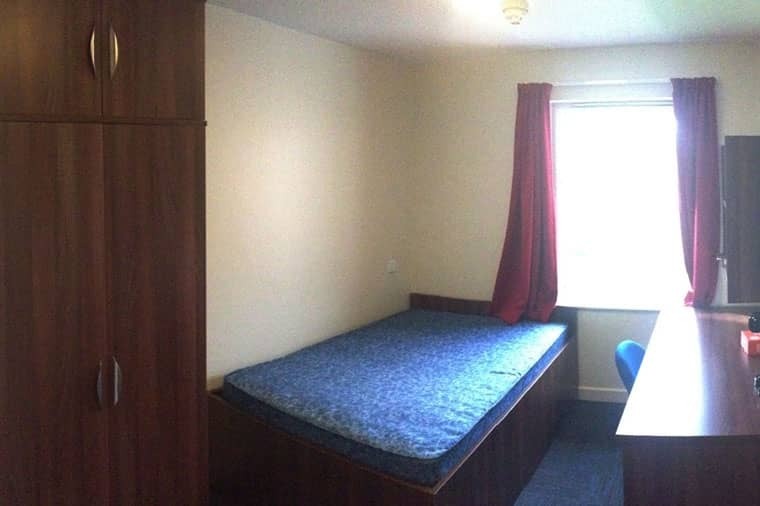 The en-suite bedrooms are arranged in flats of one to six students, all with well equipped kitchen / lounge facilities. All utility bills are included in the rent as well as free contents insurance and internet. So you can be reassured that we have everything covered. Reception is staffed 24-hours a day, and the office team are available from 9am – 5pm weekdays. Outside of office hours a security team carry out regular patrols to ensure that Great Wilkins is a safe and friendly location. We are keen recyclers, with great, green outside spaces ideal for picnics & outdoor studying. Our residences are situated on the Falmer campus of the University of Brighton. Falmer campus offers all of the facilities you will need such as a café/bar, shop, cash machine, and also a sports centre. Students also have access to the facilities on the University of Sussex campus, which is just over the road. The Falmer campus is on a regular bus route and there is an extensive cycle route which leads directly into Brighton and surrounding areas. 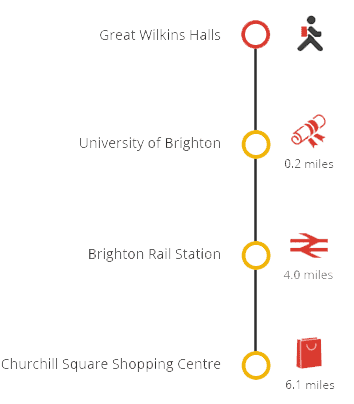 Falmer train station is a five minute walk away with regular trains that run to both Brighton and Moulsecoomb, so you can take in the sights such as the famous Brighton Pier as well as a wide range of museums and parks. For Football fans, Brighton FC’s AMEX Stadium is just a five minute walk away. Great Wilkins Halls of Residence are managed by Sanctuary Students on behalf of Brighton University. University of Brighton’s accommodation office receives and processes applications for accommodation. Once you have been offered a place with the University of Brighton you will be sent further information on how to apply. Students can collect keys on the day that their contract starts. Reception is open Monday to Friday between 9am and 5pm. Security staff the office between these hours, and can assist new students with delayed travel. All students must provide photographic ID when collecting keys, either a driving licence or passport. The University actively discourage students driving, with limited parking; spaces are reserved for disabled students only. There are a limited number of spaces allocated to Great Wilkins at Paddock field Halls. If you choose to move out voluntarily before the end of your tenancy, or if your occupancy is terminated as a result of a breach of discipline, you will still be responsible for paying your rent up until the end of your tenancy. However, if a replacement University of Brighton student can be found by yourself and is approved by us, they may take over the tenancy. You will need to pay your rent until the replacement tenant has moved in. Find your nearest National Health Service (NHS) Doctor or Dentist on the NHS Services website. Student possessions insurance is provided through Endsleigh Insurers, for all students for the 2014-15 academic year. This covers a range of belongings such as laptops, sports and electrical items and clothes. The insurance certificate for the 2014-15 academic year is available below.